We are big fans of off-season travel. It’s not that we don’t like people, but crowds in hot weather, in cities and in museums, do make for a lesser quality experience in our opinion. So we selected January for a trip to Firenze, knowing it could rain, but also knowing there would be no crowds. 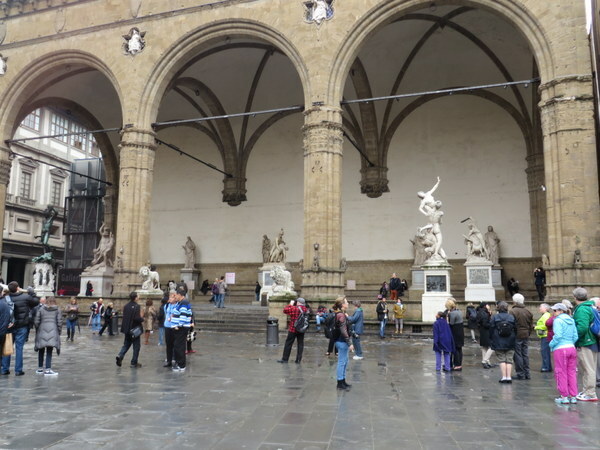 Since Firenze is a museum-intensive town, rain would not present a huge problem. Me and my shadow. 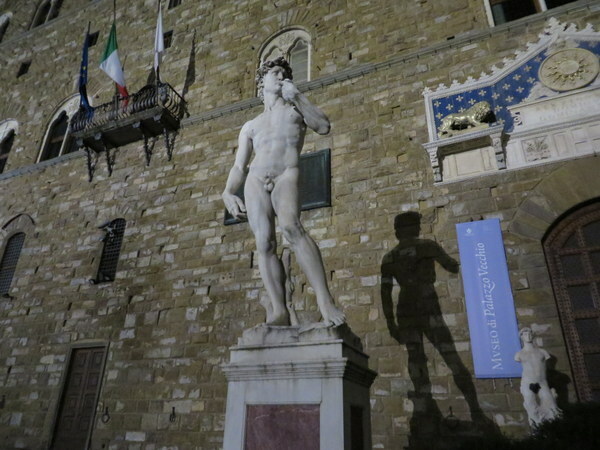 Michelangelo’s David (actually the copy) outside Palazzo Vecchio in Firenze. We’ve been here for 30 hours and done more in that time than we usually do in a 3 day trip: We’ve been to 5 museums and the Duomo and walked some 31,000 steps according to my pedometer. In the high season, with crowds, we’d never have lasted. Luckily the rain has occurred only when convenient to us. It rained while we were sitting under cover at lunch; It rained when we were inside taking una piccola pausa today, and it rained when we sat for an aperitivo after tromping through the Uffizi Gallery. Last night was clear and moonlit contributing to a lovely romantic stroll and the opportunity to see the fine Giambologna sculptures in the Loggia dei Lanzi without anyone in the way. Moonlight over Piazza della Signoria, Firenze. We saw the real David, in the Accademia, without having to wade through a thousand people. Truly a treat as Michelangelo’s unfinished Prigione also lacked observers. The Medici Chapels were almost deserted, and each and every room of the Palazzo Vecchio could be enjoyed. Two Giambologna’s, several Roman era pieces, and few human beings. Piazza della Signoria, Firenze. 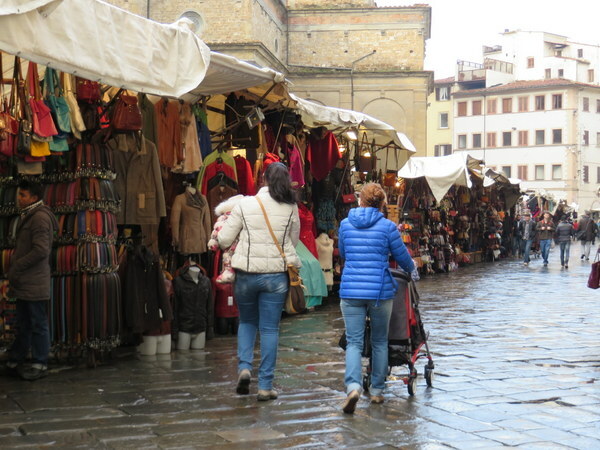 Don’t tell anyone, but hotel prices are lower in the off-season, vendors are willing to deal, and one does not have to dodge motorini in the pedestrian-only center of Firenze. 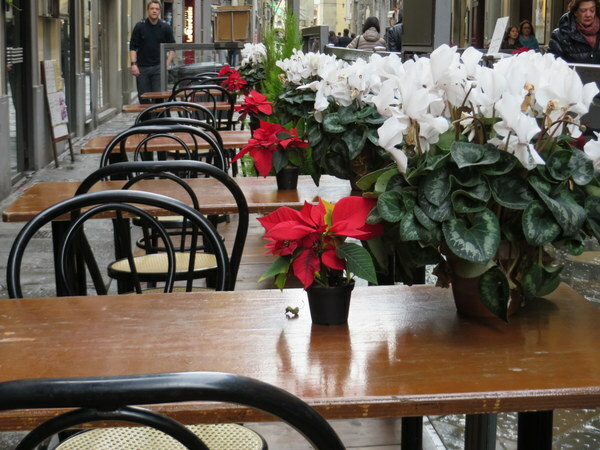 Empty tables hopefully awaiting patrons, Firenze. San Lorenzo Market, Sunday morning. No crowds; Bored vendors. I meant to say, going up inside the CEILING in the Palazzo Vechio, which, as you remember, is HANGING – an idea that Vasari had and somehow it has held over all these years. Vasari was an amazing guy. But we think of him for history, and not hanging ceilings. Firenze! A perfect time of year to visit. And 31,000 steps – wow! I have been lucky to get to 15,000 in one day. ( And then my legs ache for days.) Regarding Firenze, my book group just did a 2fer on the 2 Inferno’s. Dante’s and Dan Brown’s. The woman who recommended this ( who is a college professor of course ) suggested we see how well Dan Brown used the Inferno structure in his novel. I didn’t get far enough to truly appreciate this, but I did grasp some of it. ( Got a little way in to Dante’s – but did plow through Brown’s ). One of the really fun things was finding about all the things I have missed in Firenze, and need to go back and see. 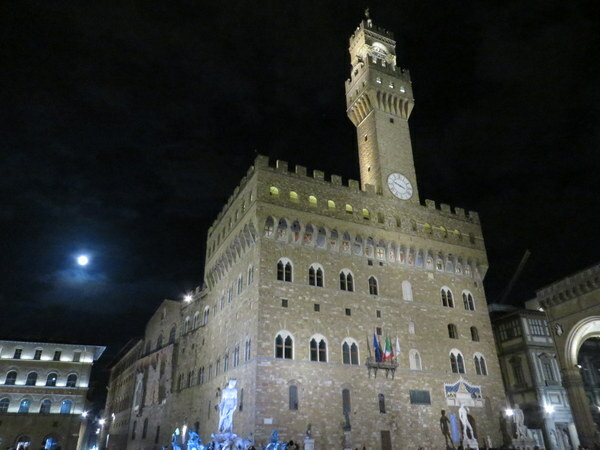 The passage OVER the bridge, being able to walk up inside the Palazzo Vechio, and Dante’s death mask are 3 of them. I loved that you chose to go in winter – REALLY a good idea. The last time I was in the Riccardi Medici Chapel ( one of my favorite in the entire world ) it was chilly and raining and they let me stay for a long time. So thanks for doing this – it is a nice virtual visit for me. Thank you for the comments Gayle! Ric was in the middle of reading Brown’s “Inferno” when we visited and it was a big WOW! for him. And then there’s the “lost” DaVinci that may be in the Hall of the 500. Next time we are in Firenze, we will take the Vasari Corridor tour. You should join us! Gaby your pictures are amazing! I am in awe! Thanks for reading and I look forward to keeping up with YOU! Lovely place at all seasons! I adore Firenze, what a treat to practically have it to yourselves! Thanks Bianca! It was amazing! I adore Firenze. What a treat to have it practically to yourselves! Off season travel makes a lot of sense. As someone who used to live near ski areas, the season flow of visitors could be overwhelming Even locally, I try to go to popular places during the week to avoid crowds. I bet seeing David was amazing! Too true Josh! I saw David when I was 19 (about 100 years ago) but it was July, it was hot, I was a kid. I really appreciated seeing him now after seeing so much of Michelangelo’s work. We do travel “in season” too (our trip to Switzerland a couple of weeks ago, the Dolomites in July), but staying outside of June-Sept for the hot spots is sweet for us. We did Venice in December twice, and it was far better than when we went last September and the crowds were thick! I’d also rather hike at 60 degrees than at 80!